It sounds like a dream job, doesn’t it? Jetting off to exotic places, being plied with endless food and drink on someone else’s dime, being able to say to yourself you know, I really shouldn’t have that third helping of _____ (insert name of some fat- or sugar-laden local specialty), but what the heck, it’s my job! Sure you have to put some words down on paper about the whole thing when it’s over, but that’s a small price to pay for a job that never actually feels like work while you’re doing it, right? Um, well, sometimes. Maybe most of the time. But as I discovered last week, there are also times when all that flies out the window and the job you’re stuck with resembles a paid vacation less than it does some milder forms of torture. I’ll explain. As you know I do occasional writing for the fine British magazine Food and Travel, and last week I accepted an assignment that took me down to southern Spain, poking around the lovely, garden-fringed city of Murcia and criss-crossing some of the region’s fertile backroads. All was going swimmingly – the food was copious and fantastic, the landscape beautiful, the producers friendly and brimming with printable quotes. It was quite exhausting, as it always is – there is, after all, so much ground to cover and so much to eat and only a few days in which to do it – but it was certainly nothing I couldn’t handle. But then the worst thing that could happen, did. I got sick. I know, I know, there are actually many things much worse than that, among them plane crashes, bombs exploding, kidnappings, etc., but understand that those all would have the advantage of bringing the assignment to an end. Getting sick, however, did not. It just made the whole thing infinitely harder. It happened at the end of my second day there. We had spent the afternoon eating tapas – from about a dozen different places – before diving back in and finishing off the night with a ten-course meal at one of Murcia’s best restaurants. I went home stuffed to the gills but otherwise feeling fine, and promptly went to bed. About four o’clock in the morning, though, I woke up in a haze, dazed and disoriented but knowing something was terribly wrong; I barely made it to the bathroom before my body began its eviction process of something it didn’t want in there. From there I spent the rest of the night huddled next to the toilet in agony – alternating between cold sweats, hot sweats, dizziness and nausea, and cursing my foodhardiness at ever agreeing to sacrifice the sanctity of my stomach for something as inconsequential as professional gain. I don’t know if you’ve ever had food poisoning – I certainly hadn’t before last week – but after your body finally manages to get rid of whatever little beastie thought your digestive tract looked like a fine new place of residence, there is one thing, and one thing only, that you feel you will never be able do again. That of course is eat. But that wasn’t an option. We had another three whole days of non-stop eating on the itinerary, and missing even part of it would seriously compromise the article. I had no choice – I simply had to soldier on. At our first engagement the next morning – a cheese factory – I quickly came to regret that decision, when, after showing us their facilities they passed around a plate of samples for us to try. Not wanting to be rude, I took a tiny nibble; moments later, in mid-conversation with the firm’s director on the benefits of small-batch production, I had to excuse myself in a hurry to find a place to regurgitate it. Believe me, I have never been so embarrassed in my life. I did get progressively better over the next few days – my fever and nausea subsided and I was able to actually ingest things without fearing they would find their way up again a few minutes later, but my stomach was still not operating at anywhere near full capacity. It remained so sensitive, in fact, that I was only able to force down a few tentative bites at most of our remaining meals, something that distressed me as much as it did the generous restaurateurs who laid on course after course of their very best dishes for me to try, only to see them sent back to the kitchen uneaten. The irony, of course, wasn’t lost on me – here I was, being served exactly the kind of food I lie awake at night dreaming about, as much as I wanted and all of it free – and I was physically incapable of eating it. Life, you are sometimes very cruel. But oh, what is up with that fruitcake? Here I’ve enticed you with that photo and haven’t said a word about it. Ah, well you see I just couldn’t abandon you before Christmas without a recipe, or more precisely without this recipe. I’ve been dumping a lot of unfair abuse on fruitcake lately (even going so far as to compare it to subdividing bacteria, and isn’t that a funny analogy now in light of the story I’ve just told! ), but now I’m standing here with foot planted firmly in mouth because I have found the fruitcake that all other fruitcakes aspire to be. No really, this is THE ONE, the fruitcake of my dreams. The secret, I’ll have you know, is something I’ll bet you’ve probably never seen in a fruitcake before. You see those little jet-black bits poking out here and there among the pistachios and apricots and other usual suspects? Those are olives, my friends, olives, and they are what take this cake from good to sublime. I mean, olives in sweet things are nothing new around here, but still I never would have thought of adding them to fruitcake. Thankfully, though, there are people around like Elizabeth Falkner (of Citizen Cake fame) who have a bit more imagination than me, as apparently this was exactly what fruitcake was missing all along. Of course, when you look at the list of ingredients it makes perfect sense; after all, dates, figs, oranges, pistachios and walnuts are a near-perfect assembly of Mediterranean flavors, and even without the olives this cake would be pretty darn good. With the olives, however, it’s in another class entirely – all I can say is, if you think you’re a fruitcake hater, give it a shot. You may, like me, suddenly find yourself wondering how on earth you managed to have any merry Christmases without it. And speaking of Christmas, since you probably won’t see me again around here until it’s long gone (as we’re leaving for snow-covered Germany tomorrow where – gasp! – we won’t have any internet access for two whole weeks), let me take this opportunity to extend a heartfelt thanks to each and every one of you, dear readers. Thank you for sticking it out with me for yet another year, for always leaving such witty, insightful and heart-warming comments, and most of all, for giving me a reason to hit ‘publish’ every week. I honestly couldn’t do this without you. May you have the most joyous and peaceful of holidays, surrounded by good food, good cheer, and plenty of people you love. And I’ll see you right back here in 2008! This cake was very good as written, but I just wouldn’t be me if I didn’t find a few things to improve. Most importantly, I doubled the olives, because let’s face it, three tablespoons divided between two cakes is a leetle skimpy, don’t you think? I also added a few chopped dried apricots for tartness (though dried sour cherries would be nice too), I increased the liquid to make it slightly moister and I added an additional egg for stability. Oh, and even with the increased moisture and extra egg you’ll need to wait until the cake is completely cool – preferably chilled – before even attempting to slice it, as otherwise you’ll end up with beautiful mosaic-patterened chunks instead of the slices I’m sure you’d much rather be serving. Oh, and Elizabeth suggests pairing this with cheese, which I think is a fine idea, though rest assured it’s perfectly edible on its own too. Position a rack in center of oven and preheat to 350°F/175°C. Butter two 8 1/2×4 1/2-inch (21×11-cm) metal loaf pans and dust with flour. Mix the first five ingredients in a medium microwave-safe bowl. Microwave in 30-second bursts, stirring after each, until most of the liquid has been absorbed by the fruit (alternatively, heat mixture in a small saucepan just until simmering, then cover and steep until absorbed). Stir in the olives and set aside to cool completely. Sift flour, baking powder, salt, nutmeg, cloves, and cinnamon into another medium bowl. Whisk yogurt and oil in a small bowl. Using an electric mixer, beat butter and sugar in large bowl until blended. Add eggs one at a time, beating well after each addition. Beat in flour mixture in 3 additions alternately with yogurt mixture in 2 additions, beginning and ending with flour mixture. 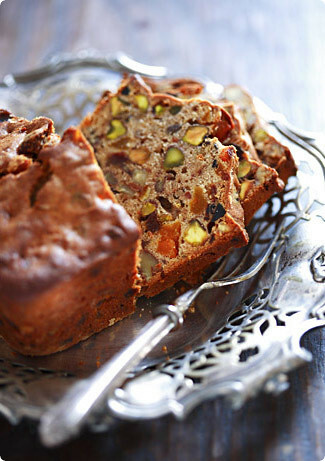 Stir in walnuts, pistachios, and dried-fruit mixture. Divide batter between prepared pans. Smooth tops. Bake cakes until tester inserted into centers comes out clean and cakes begin to pull away from sides of pans, about 50 minutes. Cool them in the pans at least 30 minutes. Turn the cakes out onto racks, and cool completely before slicing. These keep in the fridge at least a week.